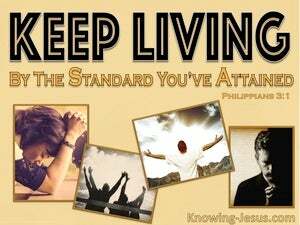 ﻿ Philippians 3:16 however, let us keep living by that same standard to which we have attained. In any case, we should live up to whatever [truth] we have attained. However, we should live up to what we have achieved so far. However in what we have attained, to march by the same standard, to think the same way. only, whereunto we have attained, by that same rule let us walk. Only let us hold true to what we have already attained and walk and order our lives by that. So, we should continue living by the same [standard] that we have [already] attained. But as far as we have attained, let us walk by the same rule, let us have the same mind. Only, as far as we have got, let us be guided by the same rule. But whereto we have attained, let us walk in the same steps. only, whereunto we have already attained, to walk by the same rule. Only we must live up to what we have already attained. But whereunto we have already attained, let us walk by the same rule, let us mind the same thing. Nevertheless, in that unto which we have already attained, let us walk by the same rule, let us have the same mind. But, at what we before arrived, to walk by the same rule, to think the same. Nevertheless, to what we have already attained, let us walk by the same rule, let us mind the same thing. Only to what we have attained, to the same hold on. Yet, as to what we have already attained, let us walk in the same rule, let us mind the same thing. Nevertheless in that whereunto we are come, let us proceed by one rule, that we may be of one accord. Only, we must let our steps be guided by such truth as we have attained. if only we guide our steps by the standards we have already attained. 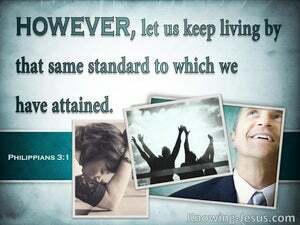 Nevertheless, let us live up to the standard that we have already attained. Nevertheless, to what we have attained, to the same continue on. Nevertheless, whereto we have reached, in that let us walk. but in what we have attained, in this let us walk. Nevertheless, whereunto we have advanced, in the same rank, stepping along. Nevertheless, so far as we have advanced, be it our care to walk by the same rule, to mind the same thing. Only we are bound to order our lives by what we have already attained. But whatever be the point that we have already reached, let us persevere in the same course. However, we must continue to live up to that degree of success that we have already reached. nevertheless, whereunto we advanced, by the same rule let us walk. But in what we have attained, let us walk by the same rule, let us mind the same thing. 15 Let us therefore, as many as are perfect, have this attitude; and if in anything you have a different attitude, God will reveal that also to you; 16 however, let us keep living by that same standard to which we have attained. 17 Brethren, join in following my example, and observe those who walk according to the pattern you have in us.